By leaning to embrace uncertainty, and develop mechanisms to adapt, you can improve your performance, with less effort and less worry. Sounds pretty good, right? Well, today I wanted to take that line of thinking one step further. Specifically, I want to talk about trading with and investing with a sprint methodology. Allow me to explain. In agile development, tasks are conquered in iterations called “sprints.” The basic idea is that you set a 2-4 week goal and work with your team to achieve that goal. These work intervals are called sprints. At the end of the 2-4 week sprint, you review your progress, adapt to feedback from the market and plan your goal for the next sprint. Do you see where I’m going with this? In the amazing book, Trading in the Zone, author Mark Douglas talks about the idea of trading in sample sizes. He recommends that traders stick to a methodology for at least 20 trades before making any tweaks. The idea here is that trading and investing happen in a very uncertain and random environment. Just by pure chance alone, you’re likely to have a broad distribution between winners and losers, as well as the magnitude of each. So make your trades or investments in sets of 20 trades (or sprints of 20 trades) instead of judging each trade by it’s own merit. You simple need a sample size of trades to reflect a given methodology. After 20 trades, you should have a more robust idea of whether or not you’re going to be profitable. 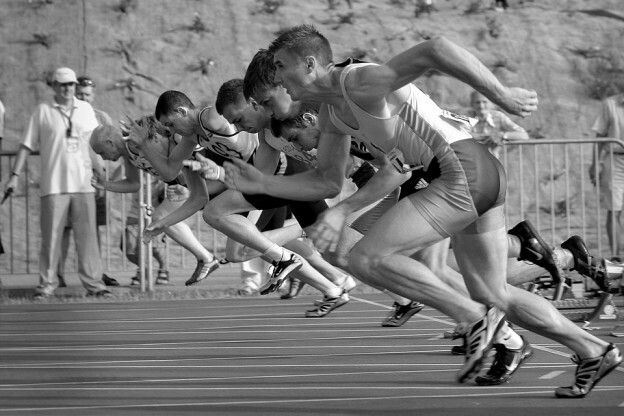 The key difference between trading and agile sprints, is that in trading and investing you need to think of “Event-based-sprints” vs. “time-based-sprints.” Instead of watching your results over 2 week periods, watch your results over 20 trade periods. So what do you think? Could you see yourself trading in sample sizes to try and isolate your edge in the markets? This entry was posted in Stock Ideas and tagged stock ideas on May 29, 2016 by Jworthy. Would you rather buy a 52 week high, or a 52 week low? Stocks trading at these extremes are often in the headlines. But not always for good reasons. And depending on who you ask, you’ll get different answers as to whether you should invest in 52 week lows, or follow the crowd and pile in to 52 week highs. Personally, I see both sides of the equation. As a value guy, I don’t want to overpay for a company. But I also understand that you can only make money in stocks if they’re going up. And picking bottom is easier said than done. What do you think? Would you rather try to pick the bottom, and focus on getting value? 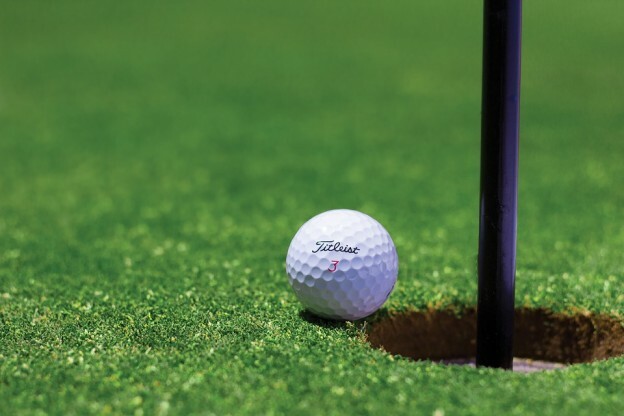 Or do you prefer to chase capital gains right now by putting momentum at your back? I’m not sure that one way is particularly better than the other. It probably depends on your personality. What style appeals to you? This entry was posted in Stock Ideas and tagged stock ideas on May 25, 2016 by Jworthy. The Perfect Speculator , by Brad Koteshwar, explains How to Win Big in Up Markets and Lose Nothing in Down Markets. The Perfect Speculator came up on my radar when somebody mentioned it as a good, but relatively unknown trading book. As I’ve already read most of the mainstream investing books, I’m always on the lookout for lesser-known books with a unique point of view. So does The Perfect Speculator deliver? 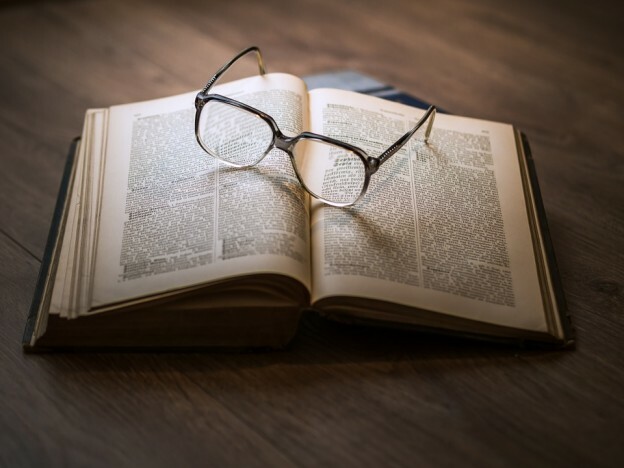 Well, in this book review I’ll tell you what The Perfect Speculator is all about, so you can determine if it’s the right trading book for you. Sound good? Great. Then let’s get down to business. The Perfect Speculator shares stock market rules in a teacher and student format. The book is written from a first-person perspective, which makes it engaging and easy to follow. The story is about an old stock market guru who is passing on his knowledge to a trusted friend and neighbour. The lessons are technical in nature. And the approach is similar to what Nicholas Darvas wrote about. The lessons are simple to follow, and the stock picking method that the book teaches is a form of trend-following for growth stocks. If you’re looking to capture lightening in a bottle with momentum stocks, this might be the right kind of trading book for you. On the other hand, if you don’t appreciate technical analysis whatsoever then you’l probably want to take a pass on this book. But overall, I really enjoyed reading The Perfect Speculator. It was concise, focused and had a compelling point of view. I’ve had some luck augmenting my value investing with technical overlays and had some luck. So this book came at a great time for me. My favourite part of The Perfect Speculator is how simple it is. The book is incredibly easy to understand, and straight to the point. Even if you are new to the market, you can learn a lot from this book. Although this book was only about 115 pages, it could have been much shorter. However the author did a great job illustrating the simple lessons multiple times in easy to understand ways. And somehow, it wasn’t repetitive. I already look forward to reading this book again. Overall, I really liked The Perfect Speculator. But there are two small complaints that I want to share in order to keep your expectations in line, in case you buy this book for yourself. So the first thing to explain, is that the book is written in a very casual style. While I’m all down for simple and easy to understand books, I think a little bit more editing could have been helpful. There were a few times I had to re-read sentences because I ‘didn’t understand them the first time. It’s not a huge complaint though. Second, I honestly just wish The Perfect Speculator was a little bit longer. I guess the truth is that the rules of speculation are relatively simple. It’s executing them consistently that’s the tricky part. We humans don’t always make it easy. And to be honest, if the book was longer, I might complain that it was repetitive. I think the author did a old job on the whole, and these gripes are quite minor. I’m still very happy to have read this book. Now with that in mind, let’s wrap this up. 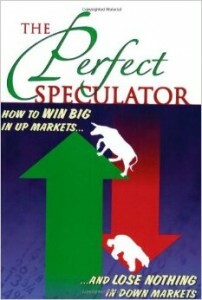 The Perfect Speculator is a wonderful read, that’s easy to understand and delivers time-tested lessons in speculation. For these reasons, I suggest you check out The Perfect Speculator on Amazon and pick up a copy for yourself. I hope you have a good overview of this book, now that you’e read my review. But if you want more information, you’re welcome to watch the video book review below to learn even more. This entry was posted in Stock Ideas and tagged investment book reviews on May 23, 2016 by Jworthy. Do you know what the agile software development is? I didn’t either. At least, not until about a year ago. Since then, it’s come on my radar in a big way. And I’m glad it did. Agile is an approach to product development management (and project management in general) that emphasizes a transparent and incremental approach, in contrast to a beuracratic waterfall plan made by a central project management office. So why am I talking agile on this investing blog? Ggile and investing have a lot in common. Agile is all about admitting that there are a lot of things you can’t control. But doing it anyway. It’s about delivering value incrementally in an iterative way and… getting feedback from the market. One of the ideas underlying agile is that you can’t ignore uncertainty. You can’t plan for everything. And even if you try, how do you know that’s the best way forward? I think investors face a lot of the same challenges: Success in trading and markets is also, in large part, about how you deal with uncertainty. You never know what’s going to happen next. I know a lot of people act like they do. But the truth is, no matter how much conviction you have, there’s only so much you can do. So if you can accept this, rather than put your head in the sand, well, I think you can do better. And you’ll probably sleep better at night too. Same goes for agile project management. The key is to keep moving forward. Acknowledge uncertainty. Come up with a plan to deal with it when it happens. And trust yourself to execute. You should also have a plan to measure your results, interpret the feedback you get from the market, and then adapt your behaviour to improve. Don’t you see the similarities? And oh yeah, golf is kind of the same way. This entry was posted in Stock Ideas on May 20, 2016 by Jworthy. For those of you who don’t know, I’m lucky to work a full-time job at a brokerage firm. Questrade: Canada’s fastest growing independent online broker. It’s a lot of fun. As part of my role, I get to collaborate with partners across the investing universe. And then I get to write about it. Cool, isn’t it? One of the things we’ve done recently is release an API, which partner organizations can connect with in order to facilitate trading, and closer integration with their own trading tools and services. And rest assured, there will be more to come soon. So if you have any other ideas of software you ‘d like to see on this list, please do let me know. Check out our educational trading webinars. There are lots of great topics, from energy market analysis, to options trading and dividend investing, we have all kinds of different insight from trusted educational partners. This entry was posted in Stock Ideas and tagged stock ideas on May 19, 2016 by Jworthy. Are you making progress? Or… at least… do you feel like you’re making progress? And how do you even know? Well, step one is having goals. Or… at least… one goal. Does anything come to mind? If not, you might be in trouble. You see while I’m sorry to be a wet blanket, the truth is, goals are the reason 3% of Harvard MBAs make 10x as much as everyone else. So I hope you have some goals. Right? Just like you need a diversified investment portfolio, you need a diverse set of goals. As in the markets, (you guessed it!) diversification offers a free lunch. Be wise and take it. If all your goals are focused on work or investing, they will tend to be correlated. And in both those situations there are many variables outside of your control. This is going to give you a very volatile life. Is that really what you want? What happens if you are a value investor with a goal to earn X%/year returns, but you can’t find any good opportunities no matter how hard you work? If you have a fitness goal, a couple work goals, a personal goal and an educational goal like doing an online course, you’ll find you live a much more balanced life. Diverse your goals by time-frame (short term vs. medium and long term) and life area (personal, health, professional, social). When you live your life this way, your entire existence and self-image won’t be tied to a single thing. Some of you are probably loathe to that idea (aspiring investment bankers come to mind). But I encourage you to be open to the idea. Not only is this latter approach to goal setting more fulfilling. But it also makes life more manageable. If you have a bad day at work, you can put it behind you. Instead of dwelling on it, you can move on to other meaningful things when you get home: like going for a run, or cooking dinner for a family member. Because that’s what life is about. This is it. You’re living it. Soak it up … and… not just the markets, or work, or taking over the world. That’s just a part of the bigger mosaic of life. So live it. Push yourself. Experience and achieve. Even if it’s something small, consistent progress towards your major goals (in all areas of life) is critical. Raise your head resolve to achieve. And take that inaugural step. Because remember, goals were step 1. And step 2, the real focus of this blog post, is getting things done. If you are not familiar: check out Jerry Seinfeld’s productivity secret for some simple inspiration to help you achieve your dreams. This entry was posted in Stock Ideas and tagged stock ideas on May 17, 2016 by Jworthy. 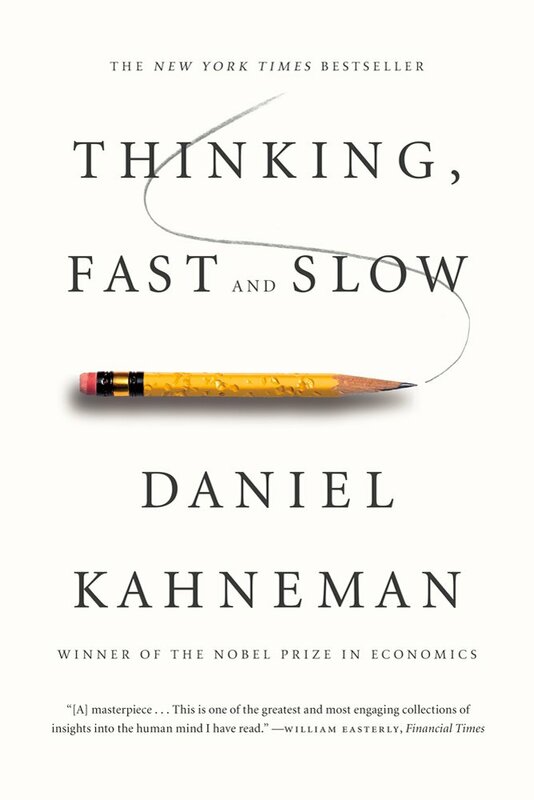 Thinking, Fast and Slow is a book written by Nobel prize winning economist Daniel Kahneman. And in this book review, I’ll tell you what I liked about this book, and even why you might want to check out this great read for yourself. Sound good? Your unknowing misbehaviour in the markets could be costing you. Thinking, Fast and Slow covers a lot of ground. The book is around 420 pages, so I’ll do my best to give you a concise summary about this discussion of prospect theory and behavioural economics. Thinking Fast and Slow looks at the different ways our brain works and how this impacts our decision making. It is a stark contrast with traditional economic utility theory that states individuals are rational actors at all times. The differences are fascinating. 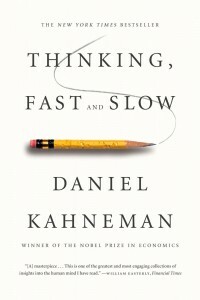 And the first part of the book talks about two ‘parts’ of our brain: the fast system and slow system. You might be able to realize this in your own life: We have a quick and intuitive part of our brain that provides intuitions and snap judgements. We also have a slower, more logical and rational part of our brain that we can engage for analytical reasoning. The book describes the different ways these two systems interact, and how they sometimes miscommunicate, causing us to make sub-optimal decisions. There are tons of illusions, fallacies and irrational choices that we make, which this book explains in detail. For example, Thinking Fast and Slow is packed with short exercises and thought experiments to help you really experience these logical shortcomings. It’s really eye-opening to see for yourself. Beyond that, Thinking Fast and Slow looks at some of the other discrepancies such as the difference between our experiencing and remembering selves. It turns out our brains play some unique tricks on remembering experiences vs. how we perceive things in the moment. The book also discusses the differences between humans and econs, the latter of which are the ultra-rational agents used in traditional economics. This discussion is incredibly valuable and a great introduction to behavioural economics. But it’s not even the best part. A big theme of Thinking, Fast and Slow is that we are wired to make sub-optimal decisions, in some circumstances. But the bigger take-home lessons is that it’s incredibly hard to catch yourself in the moment making these poor decisions. We’re not as clever as we think we are. And for me, I really enjoyed this honest approach. It would have been easy for this nobel-prize winning author to come across as condescending or smug. But instead, he freely admits that he still makes mistakes of reasoning and has trouble catching himself. This humbleness is refreshing. Striving to spot shortcomings in our logic, and fallacies in our reasoning (both in ourselves and those we care about) is a worthy undertaking. This is especially true if you are working in financial markets. The book talks about subjects like thinking in probabilities and the role of chance in gambles and how our brains are not well-squared to deal with these types of data. The book also talks about a “disposition effect” and how our brains are wired to avoid selling losers, and instead cut our losses short by selling winners. And that’s just the tip of the iceberg. There are numerous passages of this book that are can’t-miss reading for any serious investor hoping to protect themselves, from themselves. Whether you’re an experienced investor looking to improve your edge, or just interested in making better life and business decisions, Thinking Fast and Slow is the right book for you. It’s an entertaining, enjoyable and educational read. What more could you ask for? That’s why I recommend buying a copy of Thinking, Fast and Slow on Amazon. Of course, if you’re still not convinced, I encourage you to check out the video book review below to get even more information on this great book. This entry was posted in Stock Ideas and tagged investment book reviews on May 14, 2016 by Jworthy. 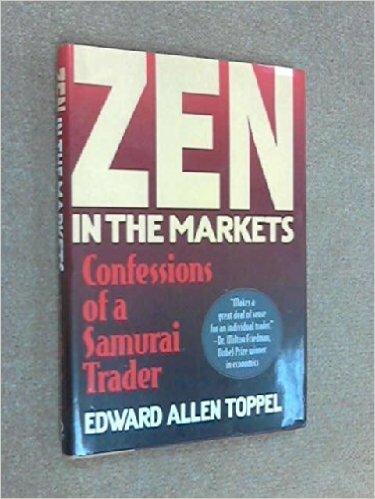 Zen in the Markets by Edward Alen Toppel shares Confessions of a Samurai Trader. This isn’t your average trading book. I’ve reviewed tons of finance books and none of them have been quite like this. Zen in the Markets provides a unique perspective on the stock market. And I’m excited to tell you why. Because even though this book was published in 1992, it provides a timeless perspective that I could see myself applying today. Now let me pull back the kimono for you. Zen in the Markets was written by professional CBOE options pit trader Edward Allen Toppel. The book was written because on one particular day trading IBM options, he had an enlightening experience. He caught himself in a moment of flow, only to realize it was one of the most profitable days of his career. From there, Toppel began embracing and studying Zen, in order to better apply it to his trading and become more profitable. And then he wrote this book. So does it work? I think that’s up to you. Let me explain. Zen in the Markets provides a really important perspective. The book starts by explaining the different ways your mind and your ego can trick you. It shows how you get in your own way and act against your own best interest in a vain attempt to feel good, or not admit fault. Besides explaining many of the ways we undermine our own investments, the book ends with some Zen parables, exercises and questions to help you contemplate your own approach to markets, and to life. The author also shares his daily routine and approach to meditation. Not enough trading books talk about the games that happen inside our head. And that’s a serious impediment to long term success. Zen in the Markets really pulls back the curtain on this area in a succinct and profound way. I’m not sure how he does it, but the author cuts through the noise and gets straight to the point. I have read 500 page books that don’t convey as much wisdom as these short pages. I actually wish it was longer. I guess that’s why I’ve re-read it five times already. And I learn something new each read. The other great thing about this kind of knowledge is that it really is timeless. It’s wisdom for the ages that kind of hits you over the head. The only problem with Zen in the Markets is that even the though the insights are so simple, they aren’t always easy to implement. For some reason, we are programmed (via our egos) to get in our own way. While this book doesn’t offer a trading system or methodology for picking stocks, it does provide very actionable ideas for how you can improve your trading psychology to improve your chance of market success. Personally, I look forward to re-reading this book on a regular basis, and doing my best to get out of my own way. So by now I think you probably have a pretty good feel for this book. Let’s wrap it up. As you probably guessed by now, I’m a big fan of Zen in the Markets. It looks at trading in a way that over 95% of other trading books don’t. It can really help broaden your thinking about the markets and potentially improve your odds of success. For those reasons, I highly recommend you pick up a copy of Zen in the Markets for yourself on Amazon. Of course, if you still aren’t convinced this isn’t the right book for you, you can watch the video book review below to learn even more about Zen in the Markets. This entry was posted in Stock Ideas and tagged investment book reviews on May 12, 2016 by Jworthy. It’s that time of year: Playoff sports. NBA edition. Toronto is firmly past the first round, so things are starting to get as exciting here as they’ve ever been. It’s fun (for once) to have an excited city with a reason to stand behind a team. But that’s not what this is about. One of the cool things about basketball is that statistics, chance and the law of large numbers lend themselves so well to this sport. This is on my mind because I’m reading the wonderful book, Thinking Fast and Slow, recommended to me by a YouTube viewer. Now, as an active investor and trader, I’m always doing my best to think in probabilities. But man, basketball really drives the point home. Part way through the first quarter of the next game, these two stars combined to score 12 points and were 6/9 from the field (or something like that). They had dramatically outperformed and were suddenly hot again. The book Thinking Fast and Slow (review coming soon) shows different ways our brain processes information and creates illusions. One of these illusions is the “hot hand” in basketball. Science has categorically proven it does not exist. Announcers and fans alike rant and rave about basketball stars being hot and cold. But in a sport with so many games and so many shots per game (particularly by the star players/Kobe) the shots taken in a single quarter vs. a multi-season career are completely insignificant. The sample size is too small. Let me show you where I’m going with this. Below are two graphs of a random-number generator that feeds into a rule-based trading system. Each set of graphs is a unique set of random numbers. The graph on the left shows an equity curve over 3,500 trades, and the graph on the right shows a random 12 trade sub-set of the same equity curve. This first curve is probably what you’d expect. But it’s not exactly typical. Losing streaks happen, in basketball and in trading and investing. The plain truth is, our brains aren’t well-wired to deal with stats like this. We quickly jump to conclusions based on key inputs. While the narrative appeal of a super-star on a hot-streak sounds nice, it’s probably more likely that they’re temporarily oscillating from one extreme to another and you’re exaggerating the contrast. You might also want to keep this in mind before you give up on your investing methodology in search of the next hot trading system. This entry was posted in Stock Ideas and tagged stock ideas on May 12, 2016 by Jworthy. Do You Follow Through On Your Stock Ideas? I’m curious to know: Do You Follow Through On Your Stock Ideas? I realize that might sound ridiculous. But it’s an honest question. A lot of traders and investors spend innumerable hours on trade analysis and stock picking. 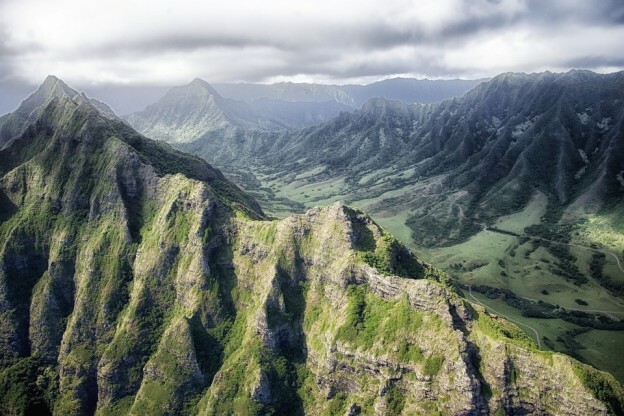 It’s an area that receives enormous attention. Everyone is incredibly focused on improving their analysis, updating their education and feeling confident in their stock ideas. Markets are random. Completely and totally unpredictable. You’re never going to be right 100% of the time. Can you accept that? If you can’t accept being wrong, how is it manifesting itself? Are you hesitating on pulling the trigger? Are you spending additional time looking at information and news articles you wouldn’t normally include in your investment process? Are you ignoring the losses in your brokerage account? But at some point, you have to accept you’re going to be wrong, create a plan to manage risk, and then follow-through on your stock picks. Doing great analysis and taking action on it are not the same thing. A lot of analysts are afraid to take the plunge. And a lot of day traders dive in head first without ample analysis. Maybe you shouldn’t. And that’s coming from a guy who’s read hundreds of finance books. Maybe it’s time to follow through. Maybe it’s time to take action. And maybe it’s even time to make some mistakes in the real world and figure out how to deal with them. By the way… as you might have guessed… the only reason I can opine so genuinely on this topic is because (naturally) it’s something I’ve struggled with myself in the past. This entry was posted in Stock Ideas and tagged stock ideas on May 9, 2016 by Jworthy.